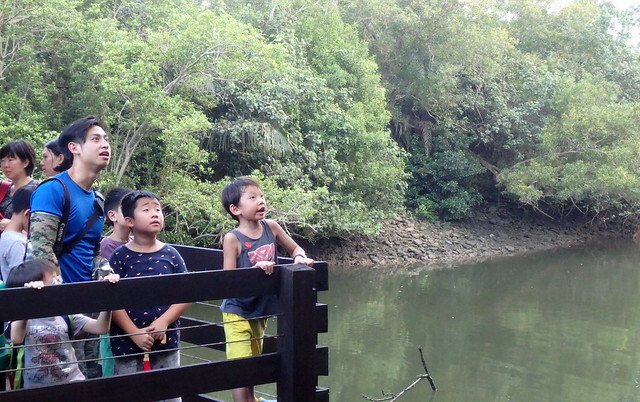 Open 24/7 and just 10 minutes from Pasir Ris MRT, next to DownTown East, Pasir Ris Mangrove Boardwalk is great for a trip with the family. Join the FREE 11 Feb 2018 (Sun) evening walk for families by the Naked Hermit Crabs at the boardwalk. Here's more on what you can see there. 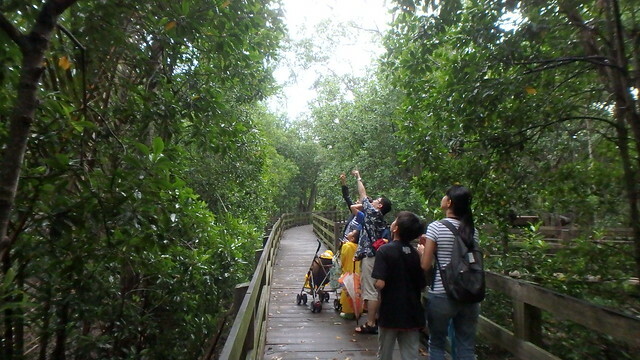 Pasir Ris mangroves is small, but has a lovely boardwalk running through it. 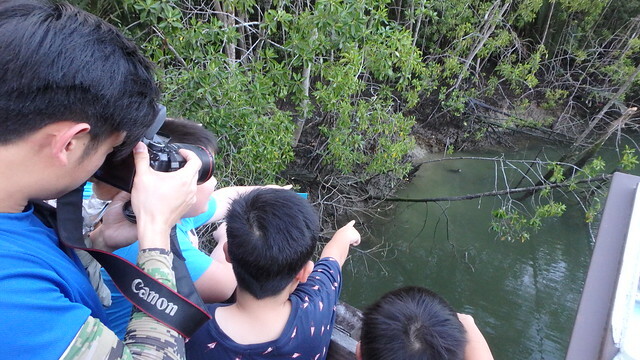 It allows a close up look at the fascinating mangroves! Such as the mud lobster mounds which are rarely seen nowadays. Here's more about mud lobsters - 'condo developers' of the mangroves! 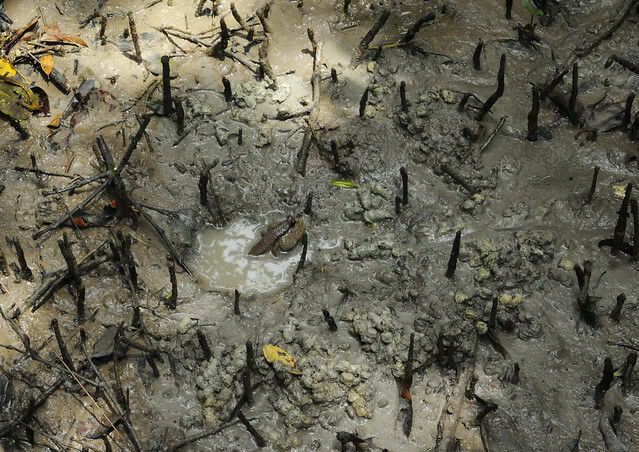 The mud lobster mound is a 'condo': other animals burrow into the mound to make their homes. 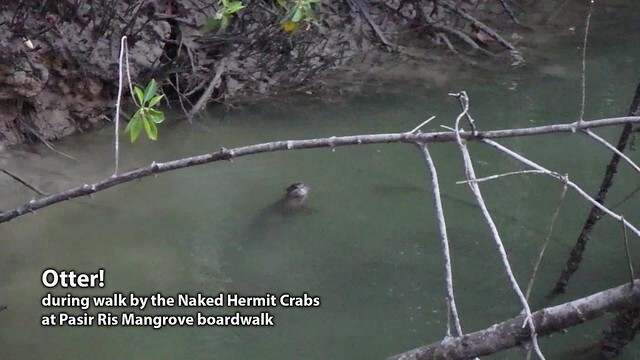 Like Tree climbing crabs, which are abundant in Pasir Ris mangroves! 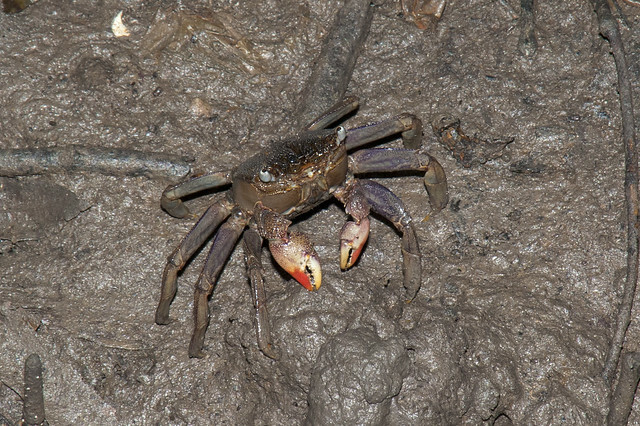 They blend in with the mud, except for their brightly coloured pincers! The boardwalk meanders among tall mangrove trees. Allowing us a closer look at the plants as well as the animals living in the mud and pools and streams. Pasir Ris at low tide, you can die die see Giant mudskippers. Often renovating their 'swimming pools' by digging mud out one mouthful at a time! More about our mudskippers. 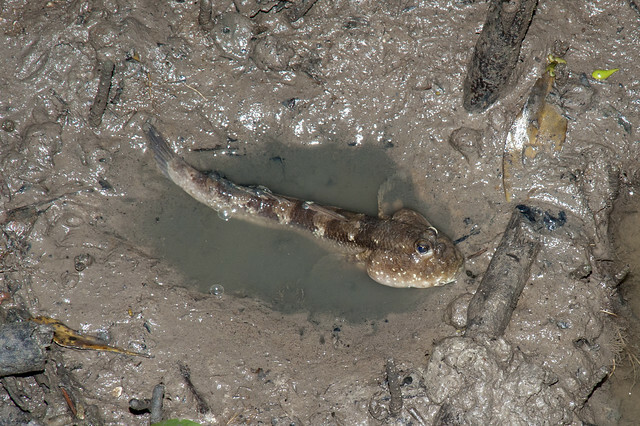 If you visit Pasir Ris at night, you can see the Giant mudskipper in his pajamas. At night, they have a pattern of bars, while during the day, they have one bold dark stripe along the body. 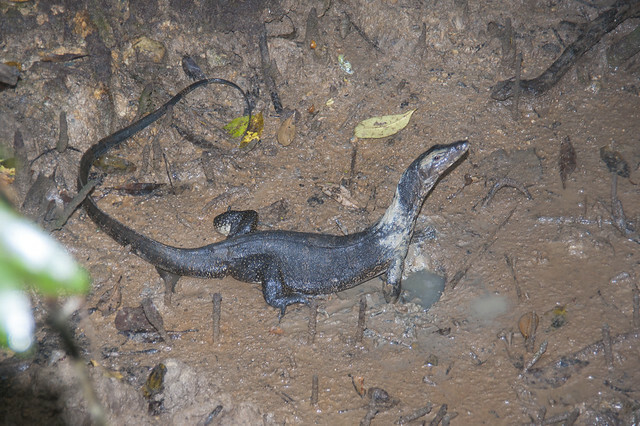 This Malayan water monitor lizard was seen head down in a mudskipper hole, probably trying to catch the occupant! These lizards are abundant in the Pasir Ris mangroves. Small ones are often seen resting on tree branches or sheltering in tree holes. 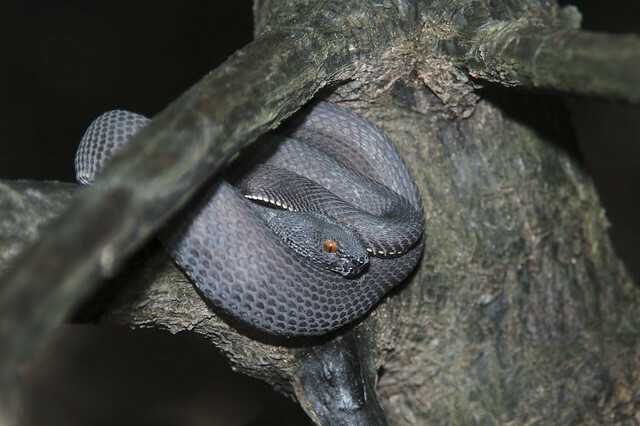 Sometimes, among the mangrove trees, we can spot the Shore pit-viper. It is harmless if we leave it alone and admire it from a distance. 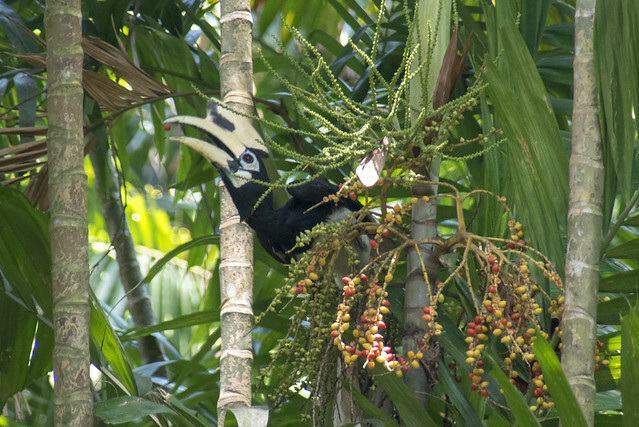 You might also encounter the Oriental pied-hornbill! A trip at high tide is exciting too. For example, you might spot Mangrove jellyfish swimming among the trees! Other large fishes may also swarm in with the water. While little crabs and snails scramble up the trees, bringing them closer to you. 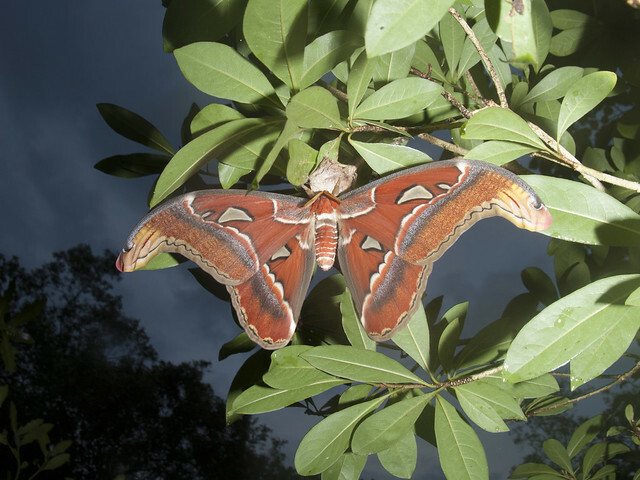 Sometimes, we may encounter the magnificent Atlas moth emerging from its cocoon near sunset. On a night trip, you may even spot fireflies here and there. But to see them, you need to keep your torch low or switched off. The boardwalk leads to a lovely little shelter on Sungei Tampines. It's a great spot to look at birds and fishes and snakes! In the water, you are almost certain to spot Archerfishes and halfbeaks. 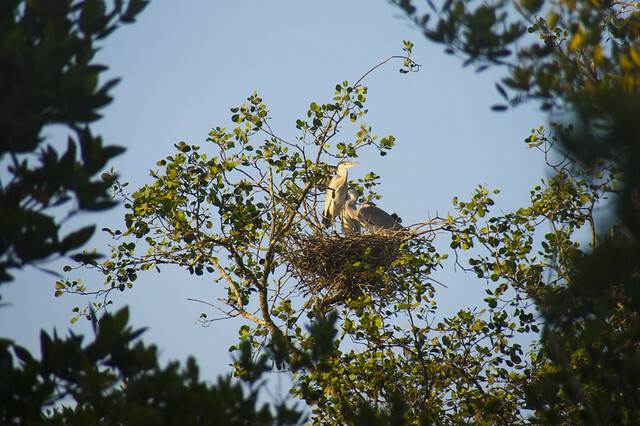 There are herons nesting and resting nearby. We can also spot kingfishers and sometimes even the resident one-eyed Buffy fish owl. This is also a great spot to see the gentle Dog-faced water snake at sunset. Often, you can see many snakes as they emerge at dusk to get ready to hunt little fishes. Once, an otter was spotted from this jetty during a family walk! Here's a glimpse of the otter! 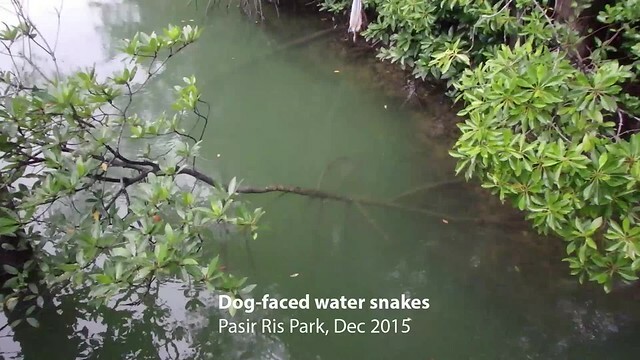 Pasir Ris is the only place on the mainland where we can easily view rare mangrove trees. Such as native specimens rare Lenggadai. NParks has also planted lots of Berembang with pretty pink flowers that only bloom at night. The trees there have grown very tall! 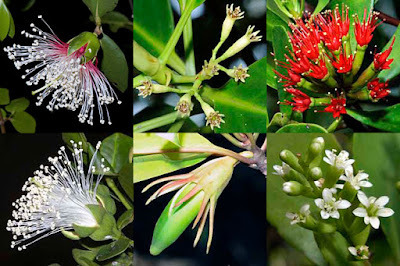 Other planted rarities include Gedabu and Tumu berau. As well as Teruntum putih and Teruntum merah. 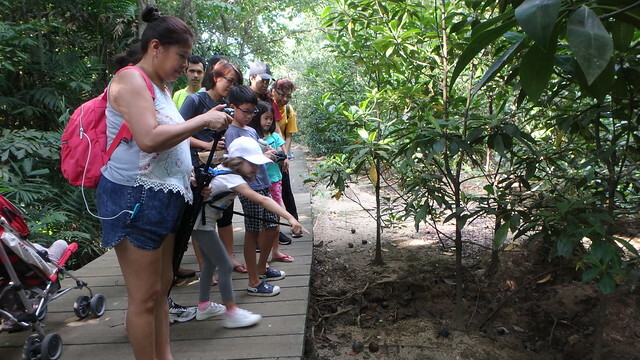 How to visit Pasir Ris Mangrove Boardwalk? Join the FREE 11 Feb 2018 (Sun) evening walk for families by the Naked Hermit Crabs! These volunteers hold walks regularly, so do check out their blog and facebook page for updates. Or visit on your own! The boardwalk is a short stroll from Pasir Ris MRT station. There is parking nearby. It's a great destination for an evening walk, to view interesting wild life that can't be easily see anywhere else! 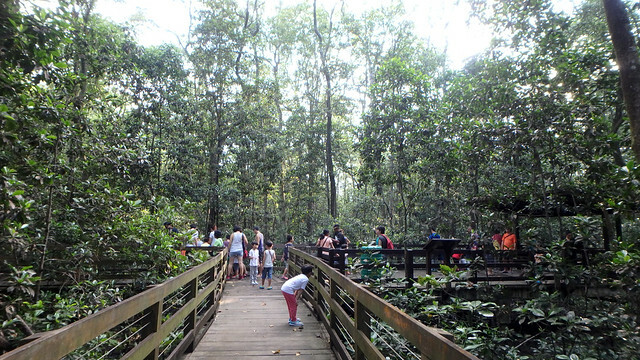 Download the NParks DIY Pasir Ris Trail Guide which includes the mangrove boardwalk. Nights at Pasir Ris mangroves are wild! Strange snakey thing at Pasir Ris on a night trip at high tide. Night walk at Pasir Ris with special snake! 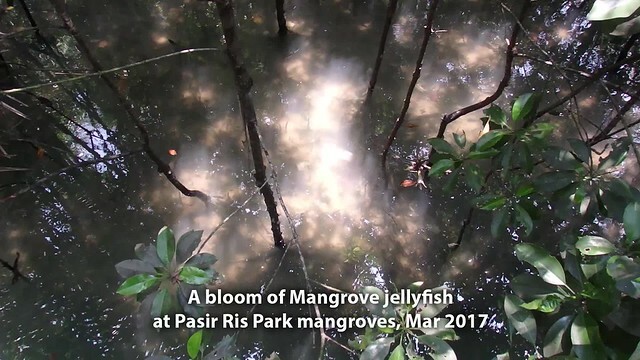 Why Pasir Ris mangroves are special! Labels: for kids, mangroves, pasir ris, shore highlights, singapore got marine life meh?